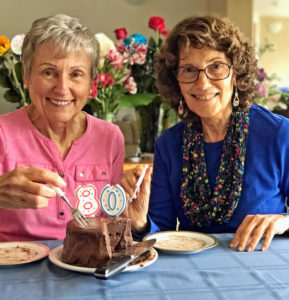 Yes, that’s right – Shelah and I celebrate birthdays in May and this year we both reached 80 – healthy, active and productive – thanks in no small part to Katy Bowman’s Nutritious Movement™ and Restorative Exercise™. And thanks to our commitment to learning, practicing and integrating movement into our daily lives. Integrating movement means moving, moving more, moving better and moving more of our bodies.) 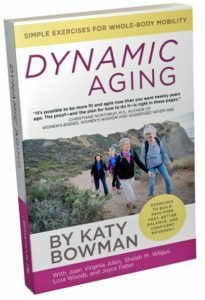 For more information, check out our book, Dynamic Aging: Simple Exercises for Whole-Body Mobility by Katy Bowman with Joan Virginia Allen, Shelah M. Wilgus, Lora Wood and Joyce Faber (2017). Little did we think we would literally be “up a tree” celebrating 80. (L. to R. Joan, Shelah, Lora and good friend Tessa.) 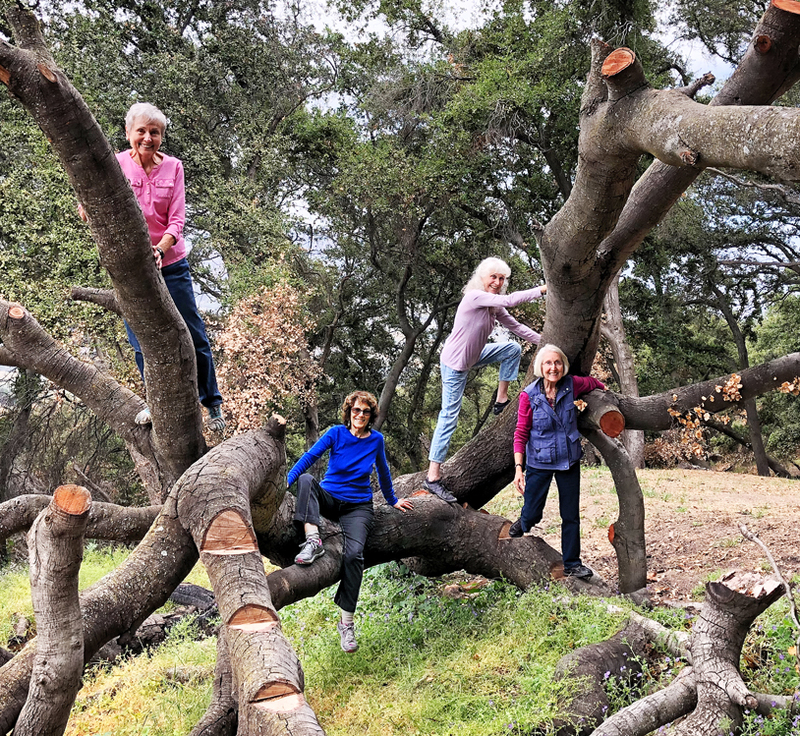 Natural Jungle Gym courtesy of California Thomas Fire and creative sculpting by brother-in-law, Ken. We thought it would be fun to look back and pick out some clues to how we got here. For me, Joan, I have always “exercised” since pre-teens. Here I am at age 10 hanging on our swing set. If only I had continued to do this or something similar daily, I am pretty sure I would be able to do chin-ups today. Check out our post on The Chin-Up Project: We Begin.) I am just grateful Katy reminded me it was okay “at my age” or any age, to climb trees and do a chin-up. I had a regular “exercise” routine from the time I was in my teens to age 71. (Since then I traded exercise for whole body movement). While I was clerking as an attorney at the California Court of Appeals, a group of us were doing Jane Fonda workouts every day at lunchtime. In my 50s I took up Olympic-style racewalking and did two half marathons race-walking in my late 60s. I have been a public speaker since high school. In my 50s I began doing presentations on fitness. I would start out by asking the audience. I would ask “What if you discovered you had the potential to live healthy, active and productive to age 120? What would you do differently?” This was prompted by reading a book (now out of print) called We Live Too Short and Die Too Long by Walter M. Bortz, II, M.D., in which he poses the idea that we begin shutting down physically and mentally way too soon in our lives. Furthermore, he advocates for staying active to realize our potential – which may be longer than we think. That’s when I began changing my expectations and my life to support living healthy, active and productive at every age. Just this change helped me focus on optimizing how I move my body to give it the best shot at realizing this potential. What might you do differently? Our family joined us at the Ranch to help celebrate birthdays 80 and 82 for me and hubby, Willis. 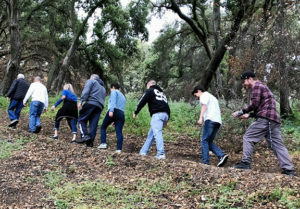 Is anyone surprised to see us celebrating by hiking the trails at the Ranch? That is turning out to be our legacy. We get out and move when our family gathers together. I am grateful we can model a healthy, active and productive lifestyle as we age. Shelah says the closest she ever got to a Jungle Gym (before the natural one at the Ranch above) was to pose for this picture in her younger years. Shelah’s focus was on ballet as she grew up. Those ingrained ballet foot positions have given her no end of trouble as she continues to work on getting the outside edges of her feet straight. Shelah has always been active and has traveled everywhere including China, Japan, Vietnam Nam, Thailand, India, Bhutan, England, Denmark, Sweden, Germany, Malaya, Singapore, Mexico, Guatemala, Ecuador, Canada, Nicaragua, Romania, Croatia, Yugoslavia, Serbia, Iceland, Costa Rica, Guam, Laos, and Myanmar. Also, she says she fell at least once per trip. In her 60s, after meeting Katy and integrating restorative exercise into her daily life, she no longer has a problem with her balance. Something to celebrate! Shelah has always been an avid walker. Her favorite was the Cotswold Trail in the UK. It’s about 100 miles long and they walked about 10 miles per day carrying light packs with clothing. They stopped along the way to eat at pubs or restaurants. To find eating places, they had to leave the trail and go down into a village or town and then climb back up to the trail (often a hike of 500-900 foot elevation) after eating. At 80, she regularly attends restorative exercise classes and integrates them into her daily life including going up and down a long flight of stairs to her second story home, walking to stores, taking the bus everywhere, and regularly walking despite a mystery injury that has made movement much more challenging. Finally, we are still working on doing our one chin-up; maybe by the time we are 81. Time to celebrate – I exceeded my expectations of 80 for 80. Well Joan, I missed this post, not all of them are reaching my e-mail. Congratulations to you both. Just one question, is your theory still true that if you pass the plate around the table with the cake on it, the calories fall off? I have used that for years, it works, because you said so.